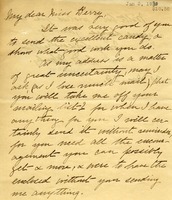 L. D. Akerly writes to Martha Berry requesting to be taken off the mailing list due to the uncertainty of her address. She also speaks highly of the good work of the School and sends a donation of $10.50. Nellie writes that she has been sick since her trip south, but is now feeling better. She sends a $500 check and knows that Miss Berry will know what best to do with it. 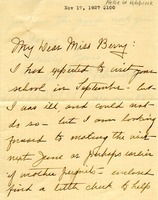 She thanks Miss Berry for a very pleasant stay in Miss Berry's home. Mrs. Long sends a $50 contribution and says she is sorry it is too late for the Silver Anniversary, but hopes it can be used to help conduct Berry's work. 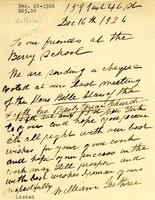 Nellie W. Hitchcock writes about a trip to Berry that she was unable to make due to illness and her plans to visit Berry in the future. She also enclosed a $100 check to help with Miss Berry's good work. Theresa sends a $5 check to "help along" Berry's good work. 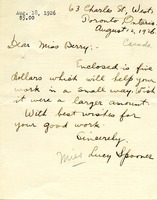 Lucy Spooner writes to Martha Berry with a check for $5 to help the school. The Men's Bible Class of the Fifth Avenue Presbyterian Church sends its $25 check to help with Berry's good work.